Evernote: Signups for New Chinese Service are "Off The Chart"
It’s been less than a week since Evernote unveiled its dedicated Chinese service, but already downloads of standalone Yinxiang Biji app are “off the charts”, according to Troy Malone, the company’s general manager in Asia Pacific. Ordinarily, Evernote was adding around 4,500 new users per day to its 1.1 million user base in China but, following the launch, downloads there have rocketed. Based on the first week, Malone says that daily new user numbers in China have been greater than its two biggest markets — Japan and the US — combined. “The US and Japan have traditionally been by far our largest user registrations, but China just eclipsed both of those. It’s like we unlocked a whole new Earth that we didn’t even know existed,” Malone told The Next Web. At this early stage Evernote is, understandably, not revealing raw user numbers, however Malone is confident that the new service will see it attract new users at higher rates than before, even as the initial burst of interest quietens as the launch effect wears off. 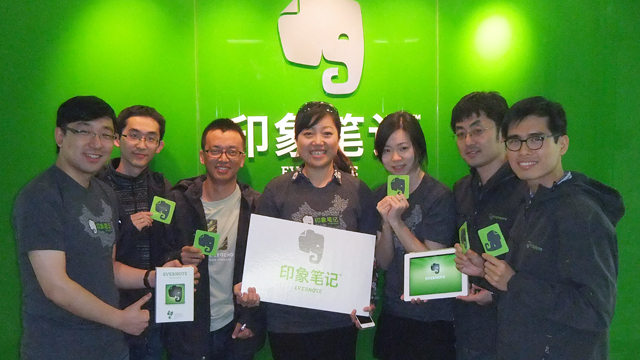 Evernote will continue to offer its US-based service in China, while giving users the option of a more localised experience through Yinxiang Biji, but the company had to make the move in order to realise its potential, according to Malone. “It got to the stage where we just couldn’t ignore it any longer,” he says, and the new service will provide a faster and more customised service, with the team working with local developers to build bespoke features for Chinese users. Any move to China brings up security issues, of course, and Evernote CEO Phil Libin recently admitted that the company would likely be unable to stop authorities making legal requests for user data. The laws and practices controlling data stored on servers in China are evolving rapidly and Yinxiang Biji will comply with Chinese regulations applicable to the service. This means users of Yinxiang Biji should be aware that Chinese authorities may have the right to access their data according to current regulations. China is the latest market that Evernote is focusing on but it already has a number of notable successes across Asia, thanks to a policy of scaling early in markets where it sees user growth. The company has 6 million registered users in Japan, which is serviced by an office of 8. Elsewhere, it has a team of two in South Korea and has just hired a pan-Asia marketing executive who is primarily tasked with helping to build the service across the Greater China region.